Browsing Apple support forums is a great way for do-it-yourselfers to learn about what issues might plague a Mac or other Apple product. That’s where I learned about Etrecheck, a free utility (donation requested) that gives me insight on what’s going on with my Mac. Getting started with EtreCheck is as easy as downloading the software, starting it and following the simple onscreen instructions. Then you let it do its work for a few minutes. You can even work while it does. I drafted this post while EtreCheck scanned my Mac. 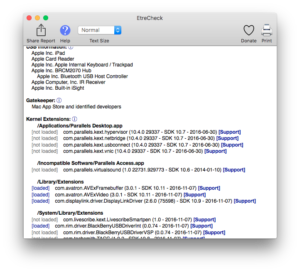 Once the scan is done, EtreCheck sounds a chime and gives you any clues you need to tune up your Mac. When I first used it, I reviewed processes that frequently failed on my Mac. EtreCheck shows problems in red text, and a number of “Support” links in blue. These links leads to Google results for the line. Note that EtreCheck doesn’t change anything. It only “reads” your Mac and provides you with information you can use to investigate and take further steps to solve any problems your Mac might be suffering. EtreCheck does have its limits. For instance, it tells me the RAM is upgradeable, but it doesn’t realized I’ve already upgraded it to the maximum (according to Apple). This is a do-it-yourself type of tool, but I still recommend people try it. Running the scan won’t harm anything, and you might find you’re more technically literate than you first thought. If you aren’t sure about what you’re doing, leave the diagnoses and the adjustments to a professional. Contact the support lines for any companies involved, whether Apple or third parties. Not all third parties are as responsive and useful as Apple’s Twitter support account, but many of these companies also strive to create a good impression among their customers. Have you found other effective ways to check your Mac for problems? Please share them in the comments below.